Our arrival in Hong Kong this morning was shrouded in mist and fog. I woke up and went out on the balcony at 7AM as we were coming into the harbor. At first I thought it was just overcast because it was drizzling, but the fog never completely went away. Later on, when we were on tour, our guide said the wind is blowing the smog here from China. After breakfast we went out of the ship to shop because we heard there was a good shopping mall on the dock. That was an understatement. Immediately upon exiting the ship we found ourselves in a full scale, high-end mall with 3 floors of stores. We explored for about an hour and almost got lost in there. They had a lot of clothing and jewelry stores that we bypassed. We checked out a few camera stores but they didn't carry anything we are in the market for. Finally, we did find a nice medium size suitcase at a good price. We'll need the extra so we can fit the souvenirs we've gotten along the way plus the ones we'll probably get over the next few weeks. Our tour for the day, "Living Traditions of Hong Kong," met at 1:20pm. Regent had people with signs stationed through the mall at each place we had to turn to get to the buses so we wouldn't get lost on the way out. We went in small buses with 2 seats on one side and 1 on the other. Each bus was limited to 14 people so the guide could manage to keep track of us in the city. Our first stop was at the historic Tin Hau Temple on Causeway Bay, built in the early 18th century. Tin Hau is the Taoist goddess of the sea. 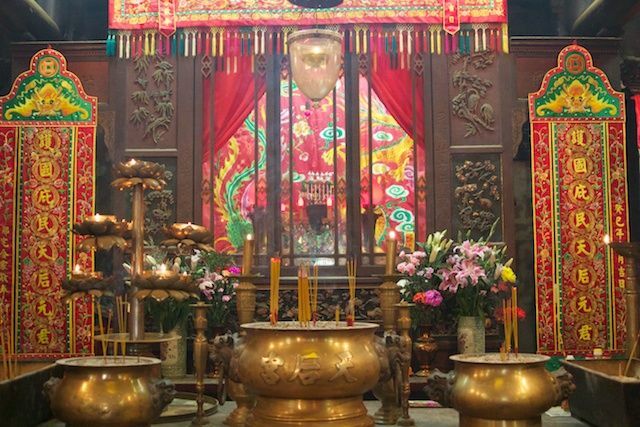 There are over 70 temples in Hong Kong devoted to this goddess, since Hong Kong was originally a fishing village. All the Tin Hau temples were originally built facing the water, but land reclamation projects around Hong Kong have pushed most of them further inland. Unlike the Taoist temple I visited in Foshan yesterday, this one still had many active worshipers, as evidenced by the food and incense offerings. To either side of the main altar were smaller alters to the general god who protects the people and the judge god who settles disputes and judges crimes. 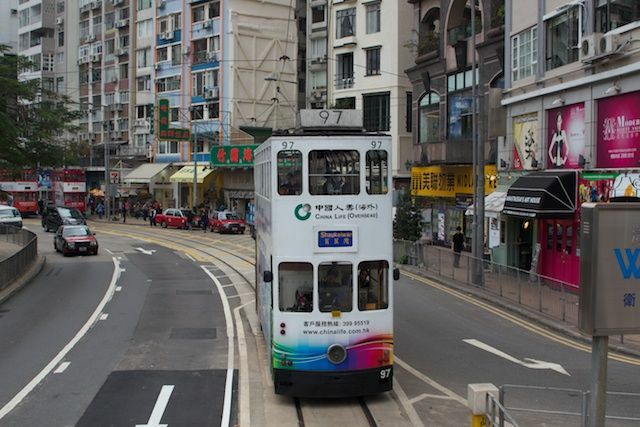 The bus dropped us off in the city next so we could board the city tram, referred to by locals as the "Ding Ding" because of it's sound. This was a fun ride on a double-decker streetcar. When we go off we walked uphill to a local cafe for tea or coffee and a pastry. They served the tea English style, with milk. It was stronger, black tea than I usually associate with China. I think it had more of the British influence. From there we walked further uphill to visit the local "Wet Market." 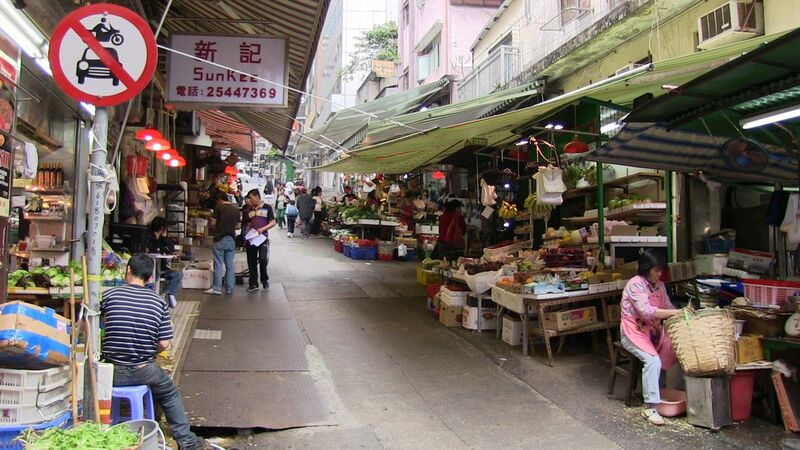 A "Wet Market" is where locals buy their food each day. People in Asia tend not to have large refrigerators. They live in very small apartments and don't have room for anything large. Our guide said her apartment is 450 square feet. These apartments are in high-rise buildings in the city and the markets are storefronts at street level below the apartments. People shop for their food fresh each day, often twice a day so they don't have to store much in their apartments. The fruit and vegetables looked wonderful, but there were a lot of strange items that I did not recognize or, in some cases, wished I didn't. Our guide told us that they waste nothing. They eat anything that moves and every part of them. After the "Wet Market" we re-boarded the bus and went to the oldest Chinese section of town where more exotic and expensive delicacies are sold. Again, interesting but probably more information that we really needed or wanted to know in some cases. Traffic was reasonable so we were able to return to the ship earlier than scheduled. This was good because it allowed us to have dinner in the ship's restaurant and be back in our room before 8pm. 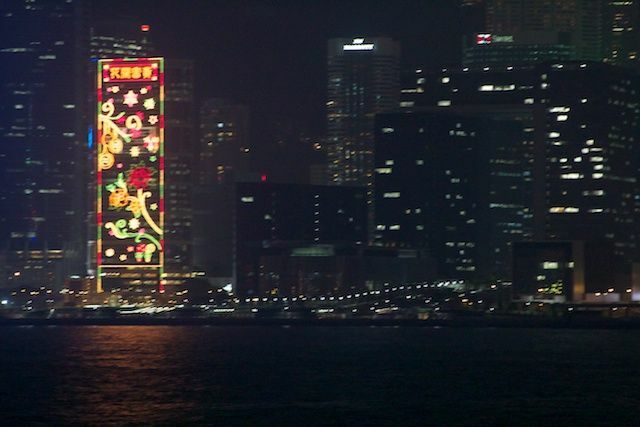 The time was important because the skyscrapers on Hong Kong island put on a light show at 8pm every night. 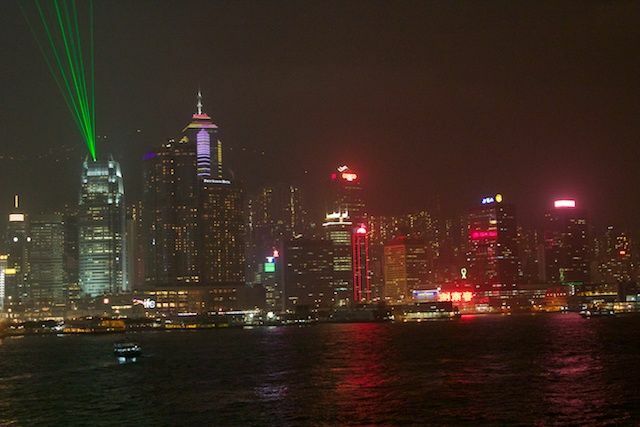 Our ship was positioned on the dock across Victoria Harbor from the island so we had a great view of the show. It lasts about 15 minutes and was very nice. I understand that it is choreographed to music that can be heard at the ferry terminal and some other places, but we couldn't hear it from where we were. Tomorrow is another transition day. Lots of passengers are getting off the ship and going home in the morning. New passengers will be boarding tomorrow afternoon. We will go out on another tour in the morning to get out of the way for a few hours.